Must be exactly 100 words. No more, no less. Must be Diablo-themed in some fashion. Must be emailed with the subject line “100 Word Story Contest” no later than 11:59pm PDT on March 21st, 2014. Lightning crackled through the air and the stench of singed demon filled her nostrils. They would pay – every last one of them – for the distress they caused her perfectly arranged hair. Her peers considered Nancy extremely vain, but what did they know? Looking your best while slaying demons was all that mattered. Perfection was ideal; perfection was required. With renewed vigor Nancy’s hatred coursed through the air, bathing all in beautiful blue electricity. So what could you possibly win for your efforts? 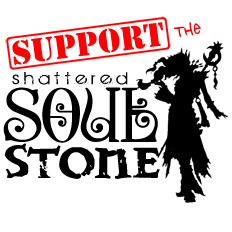 How about a Shattered Soulstone t-shirt? Maybe a copy of Nate Kenyon’s novel, Diablo: Storm of Light? Or how about a set of Blizzard’s Cute But Deadly figures given out at Blizzcon 2013, autographed by all four hosts? Note: Unfortunately this contest is only available to our North American listeners. International shipping costs are cost-prohibitive. Apologies to our world-wide fans. This is a judged contest, so make sure you put forth your best effort! Now get writing and send your 100 word story to show@shatteredsoulstone.com! The Shattered Soulstone is excited to announce our Valentines for Diablo contest. This contest will be held entirely on Twitter and will be a judged contest (no random.org this time). All you need to do is to tweet a valentine message appropriate for the Diablo universe or the Lord of Terror himself and include the hash-tag #vd4diablo somewhere in the tweet. It’s that simple! No need to include our show twitter since we’ll be keeping track of the entries through the #vd4diablo tag. Valentines for Diablo will run the length of February (every day is loooooove day) but the dead-line will be February 29th (leap year!) at 11:22 (33 secs) pm PST. So what are the prizes? That’s the most important part right? Well just like our last contest we will be giving away three prizes for our Valentines for Diablo contest. Winners of the contest will be contacted via DM and instructed to prioritize the loot they’d love to see and we’ll work out who gets what that way. Unfortunately this time we’re going to have to limit the contest to North American listeners for the physical loot but fret not if you’re one of those awesome European folk. We’ll come up with something if we receive a winning entry from Europe. Who doesn’t like to win IRL loot? Obviously none of our listeners would deny their addiction to loot. Nope. No way. We’re all loot deviants. Why else would we lose our souls to this fantastic game? We are running a contest, care of Dawnforge Productions, during the month of December. We will be giving away three prizes to three lucky loot-crazed listeners. All you need to do is to submit an email to the show or comment to this post about what your favorite Diablo class, or what class you’re looking forward to the most in Diablo 3.